“The Gospel in 20 Minutes! The Road that Takes Me Home is an outreach effort designed to assist individuals and ministries to share the Good News of Jesus Christ. 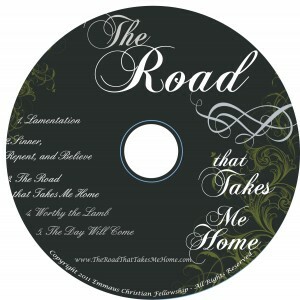 This CD includes five songs, selected because of their clear presentation of the Gospel. Emmaus Christian Fellowship sponsored the project, with the vision to produce a high quality, meaningful recording. From the outset, the plan was to offer it to ministries (e.g. recovery, pregnancy centers, outreach) as a means to draw hurting people to the Body of Christ. Emmaus Christian Fellowship continues to make the CD available to Christian ministries that serve people with the message of Christ’s justice, grace, and forgiveness. In order to accomplish this ambitious goal, we hope you will partner with us with prayer and financial support.